I just finished my afternoon tea...enjoying some "Mommie Time" with Maurice before "Mr. Ed" arrives home. She's been a bit more tolerant of me since I've returned to the work force.HA! Could it be that she'd misses me? NAH! More that she misses the fan blowing on her. (I turn it off while I'm at work.) Lovely mini tea set for one! P.S. 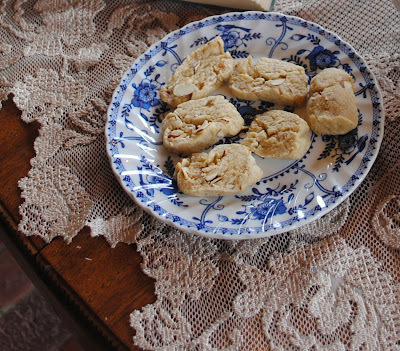 Would you mind posting the recipe for the almond cookies in a future post, please? Martha, your blue and white JB Indies is beautiful! I love that pattern myself even though I don't have any pieces of it. Hopefully, some day I'll find some. Your cookies look good too. I sometimes bake Ice Box cookies with cherries and nuts in them. Would love to join you for tea. Thanks for sharing and for stopping by for tea with me. I do believe that I can smell those cookies, warm from the oven. Your tea tradition is such a lovely one. I would like to sit down to tea at your house. It's wonderful. Your tea and cookies are inviting, I would love to join you for afternoon tea. Your tables are so charming and inviting that I always want to go to Linderhof, but you know that, so, here I am virtually. I love it! 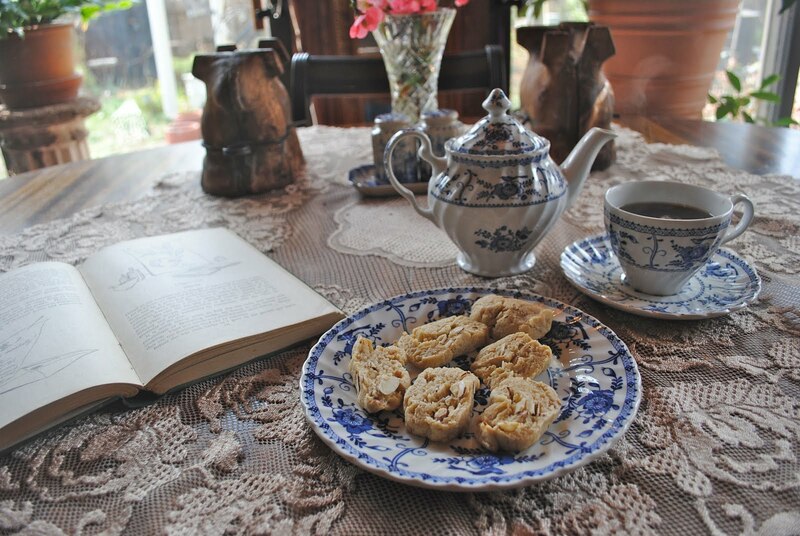 I like the coffee or tea in the afternoon too, sometimes with home made cookies, or home made bread. Thank you for sharing. Your cookies look wonderful with the almonds. I love tea set with the pretty blue and white theme. How fun! Someday I, too, will take tea at half past three! For now, I'm usually changing diapers and starting dinner! :) It's hard, sometimes, not to wish for a quiet afternoon to myself. However, I know I'll miss these times when I one day do have those quiet afternoons... :) Have a great evening and thank you for sharing your beautiful setting with us! Half past three, amazing ! 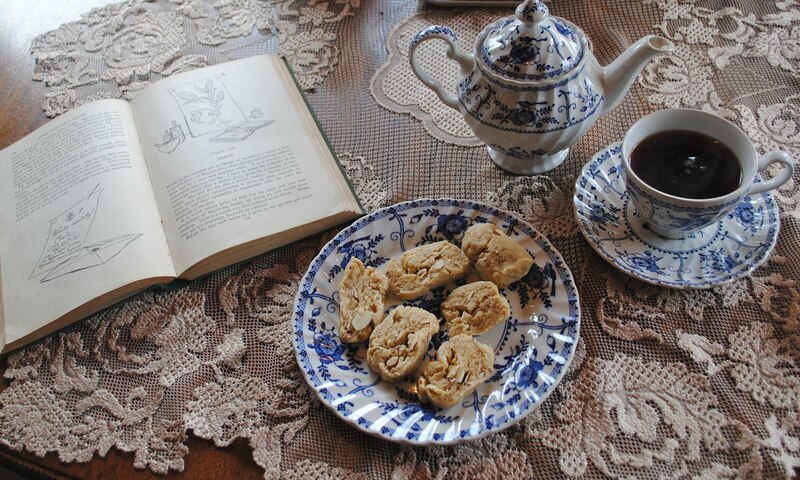 This is actually the time of day I feel the need for tea and a snack before I resume whatever tasks are at hand.Your preference for tea , snack, AND a book are also how I choose to spend such precious moments. A good book and tea time are some of the best moments of the day.Thank-you ! Oh wow, I would love to enjoy tea at half past three. So lovely and inviting. So right, afternoon tea always needs a pastry, cookie, cake or something.